Lasagne is a classic Italian dish and a great meal to make for friends and family or if you want plenty of leftovers! It originates from Naples but is made all over Italy with various takes on ingredients and methods. It’s believed to be one of the oldest pasta dishes and its name actually originates from the latin name for the type of dish it was cooked in, lasania. I opted for a traditional recipe that tastes delicious. Once you’ve made it a few times it’s fairly simple, the trick is to have all your ingredients weighed out and ready. 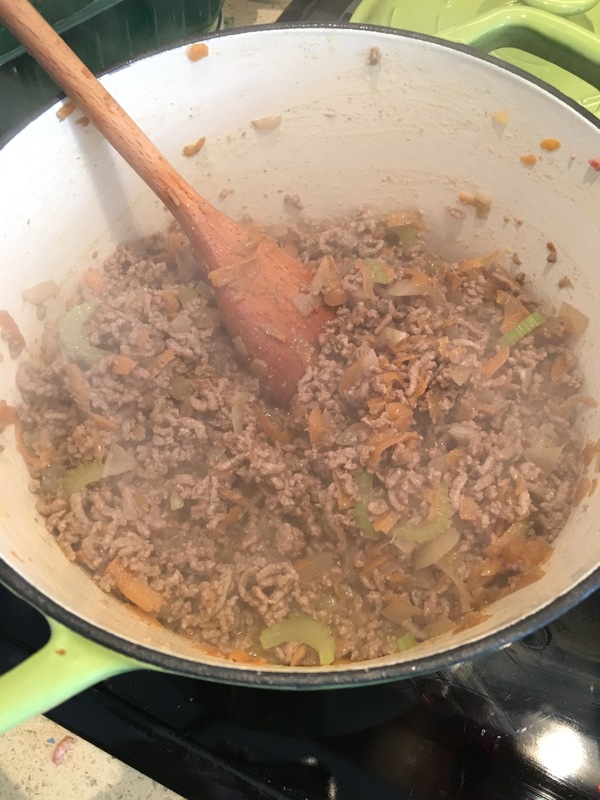 Start with the ragu, and begin by making a simple soffrito – finely chopped onions, carrots (it’s better if they’re grated otherwise finely chop and quarter) and celery, throw them all in with some olive oil until they soften on a low heat. Next add your mince (500 – 750g depending on the size of your dish!) until it browns, keep stirring, then add a glass or two of red wine – my favourite to match this dish is a Chianti Classico, it complements the sauce and you can enjoy the rest of the bottle with the finished dish! Once the alcohol from the wine has burnt off, add in your passata (500 – 700ml) and a tablespoon of tomato puree. Throw in some fresh basil leaves and leave to simmer on a low heat, stirring occassionally and season as you go. It needs about an hour and a half to become a good consistency for lasagne, you don’t want it too dry but you don’t want it too sloppy either, it needs just enough sauce to absorb into the pasta sheets and not to dry out whilst in the oven. Whilst the ragu is cooking make the white sauce (often called bechamel), homemade white sauce is so simple and tastes much better than shop bought. To give it an amazing flavour add freshly grated nutmeg (grounded nutmeg adds flavour too, just don’t overdo it. According to Gino D’Acampo cold full fat milk is also the answer. Use 100ml of milk to every 100g of plain flour and butter. So a litre of milk makes enough white sauce for a large square lasagne dish. Melt the butter, add the flour and stir to get a thick paste, then slowly add the milk and whisk as you go. Keep adding and whisking until it begins to thicken, when it does add 50g of grated parmesan and season with salt, pepper and the nutmeg. Then leave to stand for a few minutes. Your ragu should be thickened by now so now it’s time to layer up! Start with a layer of the white sauce and then a layer of pasta, I prefer using fresh pasta sheets as they are easy to cut to size (you can also freeze these) but you can use either, or make your own pasta sheets if you really want to make it from scratch! Then add a layer of ragu, followed by white sauce, lasagne sheets. Repeat one more time with the layering and then top it off with a final layer of pasta sheets and white sauce. Then grate some parmesan on top and place a few cubes of salted butter on top and place in the oven. Serve with a simple salad with salad leaves, tomatoes and cucumber and oil and balsamic vinegar along with a glass of that Chianti Classico from earlier – perfetto!